Submitted by Jeff Buster on Fri, 03/16/2018 - 11:30. The dollys which moved the post tensioned concrete bridge were not located at the very ends of the bridge - consequently the dolly's put uplift into the bridge in locations where uplift was not intended. Did this crack the structure? The end of the bridge which was to be next to the cable stayed tower is where the break took place - to the left in the above image. The outboard end of the bridge stayed up on the support pylon. The bridge shear bracing is not symmetrical. Since this structure was intended when completed to be a cable stayed bridge - how is it that the post tensioned concrete section was ever intended to be self supporting? This is an analysis in progress. Submitted by Jeff Buster on Sat, 03/17/2018 - 13:07. Today's news reports that engineers had noticed active cracking of the concrete at the north end ofthe structure two days before the bridge collapsed. They held a meeting and announced that the cracking "had to be addressed" but that the cracking was not a safety issue. Actually, the cracking of the post tensioned concrete is a spectacularly beneficial attribute of post tensioned concrete - failure was not immediate - the cracking failure announced itself visually and provided about four days warning time. But nobody took the warning seriously because of "pride" - no one wanted to admit that there was a problem. 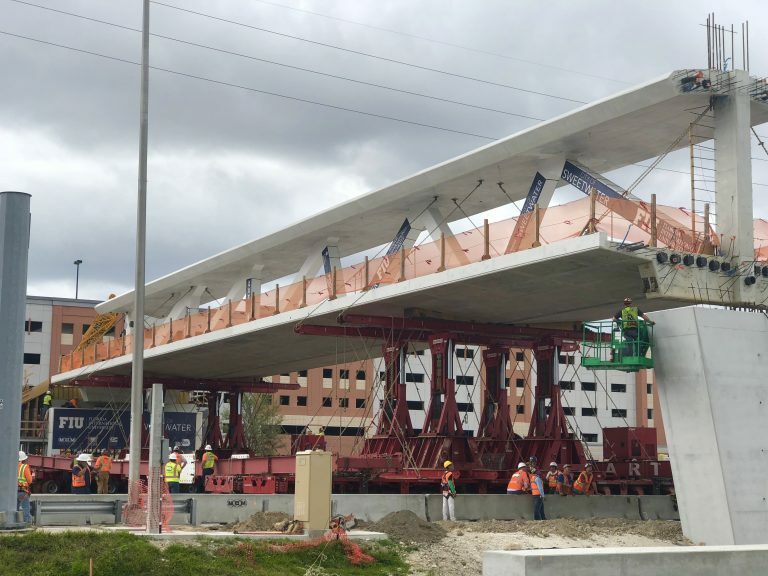 On March 10, the main span of the FIU-Sweetwater UniversityCity Bridge was lifted from its temporary supports, rotated 90 degrees across an eight-lane thoroughfare, and lowered into its permanent position. Submitted by Jeff Buster on Thu, 05/10/2018 - 10:57. Here is a well done forensic theory of the bridge failure.